Katrina 10th Anniversary Mississippi Memorial Event Set (8/10/2015); Amateur Radio Volunteers Support Michigan's Premier Bicycle Tour (7/22/2015). September is National Preparedness Month. This year FEMA is asking you to take action now - make a plan with your community, your family, and for your pets. Plan how to stay safe and communicate during the disasters that can affect your community. FEMA asks everyone to participate in America's PrepareAthon! and the national day of action, National PrepareAthon! Day, which culminates National Preparedness Month on September 30. For the last 45 years, Atlantans have celebrated Independence Day in the United States in unique fashion: by closing one of the City's busiest thoroughfares and allowing 60,000 runners, supported by 5000 volunteers, including over 50 Amateur Radio volunteers, and nearly 200,000 spectators for the Peachtree Road Race, sponsored by the Atlanta Journal-Constitution and the Atlanta Track Club. The Amateur Radio response is coordinated by Race Committee Members David Ziskind, KE4QLH, and Chris Balch, KS4MM (ARRL Volunteer Counsel and AEC for Atlanta ARES). Operators come from ARES groups and Amateur Radio clubs all over the metropolitan Atlanta area. Working closely with the Atlanta Fulton County Emergency Management Agency (AFCEMA), Atlanta Police and Fire Departments, as well as numerous federal and state law enforcement and public safety agencies, the Amateur Radio contingent provides crucial on course intelligence and safety reports for injured runners, race conditions, and even the occasional suspicious package. Learning from the experience of colleagues in Boston, net control operations for the race are located at AFCEMA's underground Emergency Operations Center. AFCEMA Director Matthew Kallmayer has worked closely with Atlanta ARES EC Ken Reid, KG4USN, to stock the EOC with 3 dual band radios (2 Kenwood V71s and an ICOM IC-2820). Accordingly, we were able to run and respond to 3 different nets (as well as a D-STAR link to the Atlanta Police Headquarters) providing coordination among public safety, Atlanta Track Club organizers, and media outlets. Race communications benefited from the loaned repeaters of the Atlanta Radio Club, the Metropolitan Atlanta Telephone Pioneers Amateur Radio Club, and the Georgia Tech Amateur Radio Club. One hour before the Airlift Northwest medical helicopter was due to arrive, the rain was coming down so hard, cars were pulling off the streets because wipers couldn't clear their windshields. The wind was gusting and heavy thunder shook the area. Yet, by 6:30 PM, the storm had cleared for the most part, and the training exercise began. Riverside Fire Authority, Centralia (Washington) ARES, Lewis County 911 center and Airlift Northwest had planned this joint exercise for weeks. 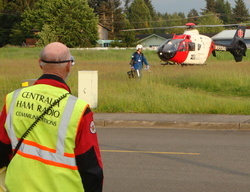 Several years earlier, Centralia ARES established eleven emergency helicopter landing zones (LZ) around the community of 16,000 located in southwest Washington State. The local hospital had been the only designated landing spot for medical helicopters, but the community is divided by two large rivers and Interstate 5. Any large earthquake would likely collapse all or most of the overpasses and bridges creating small pockets within the city that would be difficult to reach by normal disaster response services. The helicopter landing zone project began by locating open fields, school yards and vacant lots that could be used as alternate landing zones. Level landing zones of at least 100' x 100' were needed. The fields could be grass, packed dirt, a roadway or even snow. Identifiable structures such as water towers needed to be marked. High tension lines, trees, fences, light poles and other hazards had to be assessed. Each year, the Centralia ARES team checks each landing zone to be sure it still meets requirements. The landing zones were in place but had never been needed nor had a helicopter ever landed on any of them - until now. The joint exercise began to take form when we asked Riverside Fire Authority Chief Mike Kytta if he thought we could get Airlift Northwest, the local medical helicopter service located 25 miles to the north of Olympia, to fly in as a practice drill. Coincidentally, Riverside Fire was planning an exercise for their volunteers that could easily be turned into a request for a medical aircraft response. A quick e-mail to Airlift Northwest brought the response "We can make that happen." The joint exercise was set for a month later. Excitement was in the air at the next ARES meeting as the exercise was discussed. The team retrained on how to set up a landing zone, helicopter landing procedures and LZ safety. While Chief Kytta would be the overall Incident Commander, the ARES team designated a communications supervisor, landing zone supervisor, aircraft communicator and safety officers. Remaining volunteers were assigned positions around the perimeter of the landing zone as this would be in a residential area and the landing of a helicopter was sure to attract spectators. Chief Kytta asked that ARES members provide notification to those homeowners living around the landing zone, and a simple flyer was created for distribution accordingly. The Centralia Street Department agreed to provide barricades to block off an adjacent street so we would have adequate parking for emergency vehicles. They also provided orange traffic cones to help identify the 100' x 100' landing area from the air. Since it was possible that a delay might mean a night landing, ARES also purchased traffic flares and chemical lights just in case. Also, the Centralia ARES group had just completed a one year project of creating an ARES communications vehicle and this event would be the first real test of its equipment. During its last training meeting before the exercise, the team went over safety procedures again, established where team members would park the communications vehicle, the fire department aid truck and a fire engine and marked the 100' x 100' landing zone. A simplex frequency was designated for all landing zone personnel. The team felt ready to make the exercise a success, but hadn't thought about the weather. On the day of the event and in the middle of the storm, a text message to Fire Chief Kytta brought back the reply that they were ready to go if the weather permitted. As the storm passed, Riverside Fire Authority began their part of the exercise. Fire Department volunteers were dispatched to a simulated vehicle accident where the people in the car had been ejected from the vehicle. Fire Department personnel arrived on scene and began a search of the wooded area for victims. In this simulation, they were to locate four victims. One had minor injuries, two were "walking wounded," and one was in critical condition and would, as planned, need airlift out by medical helicopter to a trauma center. As the drill progressed, Centralia ARES began setting up the landing zone and prepared to communicate with both the fire personnel and the aircraft. Riverside Fire and crews located their "victims" and began transporting them towards the landing zone after requesting the local 911 center call for a medical helicopter. zone and it was timed to have the fire department aid vehicle arrive at the landing zone a few minutes before the helicopter. As the fire truck and aid vehicle arrived and parked, ARES members could hear the aircraft approaching in the distance. When the Airlift Northwest helicopter was in sight, the ARES aircraft communicator made contact and provided updated landing zone information that included wind direction, identifiable landmarks, landing zone coordinates and known hazards to the aircraft. In moments, the aircraft was circling the field and settling down to a safe landing. Everyone waited as the helicopter shut down and the flight nurse got out and approached the fire department aid crew. They simulated patient transfer procedures and then everyone was allowed to approach the helicopter to get a closer look. The flight nurse briefed the ARES team about the equipment on board, demonstrated how to load a patient and discussed patient preparation with the fire department crews. The pilot spoke to the team about the helicopter and outlined what he needed for an emergency landing zone to safely land the aircraft. Thirty minutes later, the ARES team cleared the landing zone and directed the helicopter back into the air. What began as a simple training exercise to establish potential helicopter landing zones for the community turned into an opportunity to work with a served agency, Riverside Fire Authority, and to test ARES equipment and procedures for landing an actual helicopter. The Airlift Northwest crew was generous with their time and equipment. Chief Kytta and his fire department training staff were tremendously helpful in setting up this valuable exercise. East Lake CERT (Community Emergency Response Team) in Palm Harbor, Florida is very active in Amateur Radio in the north end of Pinellas County. [Pinellas county lies to the east of Tampa with a population of about one million on the coast of the Gulf of Mexico. Clearwater is the county seat, and St. Petersburg is its largest city.] Combining forces with the Upper Pinellas Amateur Radio Club (UPARC) results in a pool of nearly 70 licensed amateurs with training that goes beyond traditional ARES training. ARES trains us to be communicators using a variety of frequencies and modes in emergencies. A CERT educates ordinary citizens about disaster preparedness for hazards that may impact their area and trains them in basic disaster response skills, such as fire safety, light search and rescue, team organization, and disaster medical operations. Using the training learned in the classroom and during exercises, CERT members can assist others in their neighborhood or workplace following an event when professional responders are not immediately available to help. One aspect of this training is communications. Many CERT teams use basic Family Radio Service (FRS) radios for this. We have found that FRS is not always reliable for this purpose. East Lake CERT realized the shortfalls of FRS and began to recruit and train Amateur Radio operators to be their communicators through Technician and General licensing classes, mentoring and word of mouth. The first CERT was born in California out of a need of support for first responders following catastrophic earthquakes. The program was intended to fill the gap between what first responders were capable of providing and the needs of the community immediately following these events. The training units were developed using lessons learned from actual events. The most immediate needs were prioritized and combined with preparedness objectives to present a well-rounded and inclusive program that would enable volunteers to prepare, plan and respond in the safest and most efficient way. In February, 1985, a group of Los Angeles City officials went to Japan to study its extensive earthquake preparedness plans. The group encountered a society that had taken extensive steps to train entire neighborhoods in one aspect of alleviating the potential devastation that would follow a major earthquake. These single-function neighborhood teams were trained in fire suppression, light search and rescue operations, first aid, or evacuation. In 1986, the City of Los Angeles Fire Department developed a pilot program to train a group of leaders in a neighborhood watch organization. A concept developed involving multi-functional volunteer response teams with the ability to perform basic fire suppression, light search and rescue, and first aid. This first team of 30 people completed training in early 1986 and proved that the concept was viable through various drills, demonstrations, and exercises. Expansion of the program, however, was not feasible due to limited City resources, until an event occurred in 1987 that impacted the entire area. â¢ Develop, train, and maintain a network of Community Emergency Response Teams (CERTs). As of November 2011, 50 states, three territories and six foreign countries were using the CERT training. East Lake CERT was established in 2005 by Mark Weinkrantz and District Chief Mark Teolis. The first class was trained by Lealman CERT. Not all teams are able to sustain the interest of their members, are not able to recruit new members, or have the funds to progress. In this regard, East Lake CERT has been very fortunate to have been able to expand their membership as well as focus on one of the most valuable assets following a disastrous event: communications. East Lake CERT has 30 licensed amateurs. They train weekly with a net held on UPARC's VHF repeater. Communicators also train with the entire CERT team in several drills throughout the year. In June, East Lake CERT activated its own UHF repeater with the call W4ELC. East Lake CERT has partnered with UPARC's 40 members to provide CERT training to UPARC members and UPARC has welcomed the CERT communicators to use the W4AFC repeater. Where do we go from here? What does the future hold? East Lake CERT has been working closely with fire departments in North Pinellas County municipalities to initiate training of Fire Department personnel to be Amateur Radio operators, position radio equipment in each station and train personnel on the use of the radios. The goal is to provide a backbone of emergency communications through Amateur Radio that can be activated in an emergency in North Pinellas County. That network could then interface with Pinellas County's EOC, or support local, neighborhood operations. East Lake CERT is about to open communications with Tarpon Springs, Florida and Sunstar (an ambulance company) to include them in the network. Should a situation arise where radio operators need to be notified of an impending emergency/disaster or requested to assist with an occurring incident, a page can be sent out using the cellular phone grid and the Internet. There are several different types of emergency paging systems and I have tried almost all of them. Currently, our local government uses this method and it is effective and easy. "But wait! If there is a disaster, those phones/Internet may not work!" Most warnings such as a tornado watch/warning or severe storm warning are broadcasted far in advance of the onset of hazardous conditions. At this point, many hams are monitoring frequencies and listening for news. Local incidents that occur without advanced warning such as a nuclear power plant evacuation or aircraft down are likely the ones where a quick call up is needed, but even these events do not necessarily take out the entire phone/Internet system. "I don't have a phone or I do not want to receive texts." Test messages could be limited to just once a week. These tests are to make sure you are receiving the sent texts. There are few individuals today without a mobile phone at their disposal. Any phone that can receive texts can be used to receive the page. When a page is sent it will likely tell you where to tune to get information such as "tune to 7200 kHz LSB or 145.450 MHz FM." That would alert operators to tune in and get the details they need for responding. A text message is sent to your phone's e-mail address, which consists of your phone number followed by the provider's "@ domain.com". Most carriers charge for this. The fee is usually small and worth it if you receive an alert. It is only free when you have signed up to receive text messaging through your phone carrier. These are the phone e-mail addresses. Just substitute/insert your cell phone number and send yourself a test message. "Who would send out the pages?" Connecticut is a leader in emergency/disaster communications support in all modes for all hazards. The ARRL Section's ARES Region 5 (covering a large portion of the western aspect of the state) executed its third annual simplex test on August 1st. The test, spearheaded by Paul Gibb, KB1TOR, was created to study how communications could be carried out throughout the geographically large Litchfield and northern Fairfield counties without the use of repeaters. The goal of the test is to light up as many EOCs as possible in the region. This year 46 stations participated in the test, which was held on the 2, 6 and 40 meter bands. Cherokee County (Georgia) CERT/ARES will be operating Special Event station N4A on Friday, September 11, and Saturday, September 12 in remembrance of those families and loved ones who lost their lives, and the Public Safety members who gave countless hours during and following the 9/11 attacks. Jim Millsap, WB4NWS, District EC for the Metro Atlanta District ARES, reports "We will be operating from the Cherokee County EOC Ham Station and the Cherokee County CERT/ARES trailer on HF frequencies in the General Class band of 20, 40, and 80-meters on Friday, but the biggest event activity is expected on Saturday. Stations are invited to check in on Friday or Saturday. A special certificate will be provided to those who make contact and send a self addressed #10 envelope." (More details will be provided on QRZ as the event dates draw closer). "I know many people would like to move now. Please don't. I know many of you want to enter the fray, come to the coast and get involved. Please, not yet. Transportation and logistics, including volunteer groups coming in, must be done in an orderly manner or we may only add to the chaos and confusion." - (then) ARRL President Jim Haynie, W5JBP"
"Numerous reports are coming in on the devastation and relief response, including ARES, manifested by Hurricane Katrina. This special release addresses initial ARES responses and planning. Everyone has seen the media reports and the public notices of various governmental agencies and Non-Governmental Organizations, so they will not be reiterated here. The purpose of this edition is to share early reports and stories of what our fellow ARES members are doing in the field in response to one of the worst natural disasters to beset the United States. These efforts are only preliminary, and in no way represent the total ARES effort, which will evolve over the hard hours, days and weeks to come. - K1CE"
Much reporting on the amateur community's response was published in QST and elsewhere, but early reporting was covered in "The Katrina Chronicles 1," November 2005 QST, pp 43-48, and "The Katrina Chronicles 2," February 2006 QST, page 50, with authors Rick Lindquist, WW1ME, and Steve Ewald, WV1X.